Epic is a beautiful surfing slang word to describe a day, a swell, or a ride that is totally out of the ordinary, transcending into a state of pure awesomeness. It is also an appropriate term to use to describe an interesting statistic I saw recently. I have not written about VistA for a while, but there appears to be a resurgent interest in the media regarding it to which I will contribute. In my last post I describe the “platform issue” as a significant barrier to commercial adoption. Another major hurdle is the unique MUMPS programming language and database from which it is constructed. We ended up producing several media pieces in order to help quelch the fears of CIO’s who were considering how to overcome this development hurdle. We typically countered with what do you care? Or more appropriately, what does it matter to you what the backend is written in? Its fast, reliable, and powers the largest health care system in the United States for the past 25 years with minimal interruptions. Furthermore, nearly all the leading software vendors in the acute care (Hospital) based information technology space use MUMPS to power their solutions. Yeah, uhuh! Let me count the ways . . . This is about as brash as EPIC gets in their marketing. EPIC systems has quitely pounded the acute care hospital IT market into absolute submission. Eclipsys, Cerner, GE – not even competitive in terms of features and functionality. Everyone knows that EPIC is the premium car in the lot (Tick Tock that Neal). 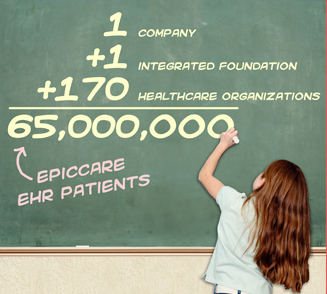 In fact, nearly every brand name health system in the United States of any reputation has selected EPIC. Let me just rip off the names to get a feel: Cleveland Clinic, Geisinger, Sutter Health System, Stanford University, Memorial System in SoCal, and the grand daddy of them all – Kaiser Permanente (in what will be a $10B deal). Judge Judy (EPIC Founder and CEO), for all her eccentricities (including not giving media interviews although I physically saw her once at a HIMSS show), knows how to run a pretty tight ship. What this also means, of course, is that MUMPS is going to be around for a very, very long time. The sheer number of MUMPS-based EHR implementations is only going to increase which guarantees that MUMPS is NOT dead . . .its future is EPIC! It’s not only not dead its future is bright. Both Vista and EPIC used some form of broker to communicate between the database and client. If EPIC would convert to the Cache class model and away from KB SQL we would see a huge speed increase. While other vendors and customer struggle to use the system in meaningful way, the MUMPS based vendors can make small changes to workflow or small customizations quickly and easily. That’s another strength of EPIC, its “programming point” architecture is one of its great strength. More and more post go-live EPIC implementations are looking for MUMPS programmers to use this architecture. I have worked in MUMPS for over 30 years now. Back in 1980, we heard that MUMPS is dead. We heard during the 1990’s that MUMPS would be going away any day now. Here we are, late in the first decade of 2000, and people are still telling us that MUMPS is dead. Well, they better sit up and smell the coffee, cause that wishful thinking by the vendors is no closer to being true now, than it was back in the 1980s. Don’t you think if they could have successfully replaced MUMPS, that they would have by now? What is taking them so long? Most MUMPS systems are replaced for political reasons, and not for technical or financial reasons. The performance is just too good and the flexibility and scalability are excellent with MUMPS and VistA. As for supportability, VistA systems have much better up-time than most other systems. We have had for decades. When will the education institutions gear up to start teaching it? I am very impressed with our ongoing Epic installation. Their organization is excellent and appears as good as their marketing. We seem to be replacing Meditech with a more flexible and responsive system. To clarify to all parties….Epic and others alike have succeeded using MUMPS as their foundation which is the creation of MEDITECH Founder – Neil Pappalardo. To those (Ex: Dr. Lofton) whom believe Epic is a far better product than MEDITECH and deserved of its price tag…would you pay 10 times the amount for an Acura TL over an Honda Accord ($25k vs $250k). I thought not…but somehow even the smartest of people have fallen prey to the Epic “flattery”.